For other uses, see Bletchley (disambiguation). Bletchley is a constituent town of Milton Keynes, in the ceremonial county of Buckinghamshire, England. 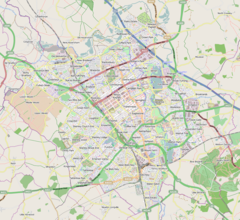 It is situated in the south-west of Milton Keynes, and is split between the civil parishes of Bletchley and Fenny Stratford and West Bletchley. Queensway, the main shopping street in Bletchley. Bletchley is best known for Bletchley Park, the headquarters of Britain's World War II codebreaking organisation, and now a major tourist attraction. The National Museum of Computing is also located on the Park. The town name is Anglo-Saxon and means Blæcca's clearing. It was first recorded in manorial rolls in the 12th century as Bicchelai, then later as Blechelegh (13th century) and Blecheley (14th–16th centuries). Bletchley grew from an obscure hamlet on the road from Fenny Stratford to Buckingham with the arrival of the London and North Western Railway in 1845 and its subsequent junction with the Oxford-Cambridge Varsity Line shortly afterwards. Bletchley grew rapidly to service the junction. Bletchley railway station was for many years an important node on the railway. It is now one of the four stations which serve Milton Keynes. In the urban growth of the Victorian period brought by the railway, the town merged with nearby Fenny Stratford. Fenny Stratford had been constituted an urban district (with Simpson) in 1895, and Bletchley was added in 1898. The urban district was renamed Bletchley in 1911. In the early 1960s, there was a further substantial expansion of the town, with people from London being relocated by the Greater London Council, mainly to a London overspill estate to the south of Water Eaton. The population of the urban district increased from 5,500 in 1921 to 17,000 in 1961. It was The Plan for Milton Keynes that would bring the most dramatic change to the future of Bletchley. Bletchley was included in the "designated area" when the "New City" of Milton Keynes was founded in 1967. Bletchley thrived in the early years of the growth of Milton Keynes, since it was the main shopping area. Bletchley centre was altered considerably when the Brunel Shopping Centre was built in the early 1970s, creating a new end to Queensway. (Previously, Queensway – formerly known as Bletchley Road – was a continuous run from Fenny Stratford to Old Bletchley). Bletchley's boom came to an end when the new Central Milton Keynes Shopping Centre was built and commercial Bletchley has declined as a retail destination in recent years. The districts that make up this civil parish are Brickfields (includes the Blue Lagoon), Central Bletchley, Denbigh (including Denbigh North), Eaton Manor, Fenny Stratford, Granby, Manor Farm, Mount Farm, Newton Leys and Water Eaton (includes "Lakes Estate"). For many years, Denbigh has been an important employment area on the immediate north-eastern outskirts of Bletchley along Watling Street, although still in the civil parish of Bletchley and Fenny Stratford. Perhaps its most famous residents are Milton Keynes Dons F.C. (at Stadium MK in Denbigh North), and their former club sponsors Marshall Amplification (just across Watling Street in Denbigh West). In 2005, large commercial retail developments opened. The supermarket chain Asda opened their biggest store in the UK in November of the same year. The Asda supercentre remains, to date, the largest Asda store ever built at over 120'000 sq.ft. And the Swedish furniture retailer IKEA built and opened large stores at Denbigh North on land formerly occupied by the Sanctuary Music Arena, the Irish Club, a sports ground and other sports facilities. Tesco responded by expanding its store at the north-east edge of Bletchley/Fenny Stratford. The sale of the land to Asda and IKEA provided the capital to develop Stadium MK. In subsequent developments, an hotel, a variety of shops, a multiscreen (including IMAX) cinema and a number of restaurants have been added. (See main Denbigh article for details). Newton Leys is a new development with housing for up to 1650 homes with employment areas, shops, a school, community facilities, new park, hotel and leisure facilities built on two former Newton Longville Brickworks and farmland. Although it forms a part of the Bletchley and Fenny Stratford Town, it is beyond the Town boundary marker, and is separated from Bletchley and Fenny Stratford by the West Coast Main Line, and from West Bletchley parish by the Oxford to Bletchley railway line. An area of the Newton Leys development site has a history going back as far as the Iron Age, an archaeological evaluation commissioned by the developer in 2006, found an area of occupation in the floor of a stream valley in the southern part of the site. This comprised at least one circular enclosure interpreted as either a roundhouse or stock enclosure, and a series of ditches, gullies and small pits and postholes as well as several spreads of occupation deposits including a significant find of Iron Age pottery. One of the original claypits created by extracting clay for use in the brick making industry, now forms Willow Lake. The lakes at Newton Leys form part of a sustainable drainage system/balancing pond system designed to manage excess water caused by storms. Jubilee Brooks runs through the centre of the development, which rises north of Drayton Parslow and flows through the settlement towards the West Coast Main Line passing through the Lakes Estate where it joins with the Water Eaton Brook eventually flowing into the River Ouzel. The Blue Lagoon is a Local Nature Reserve which attracts many visitors every day. Schoolchildren in Bletchley are often taken on trips to learn about the history of this site. It was formed in the winter of 1946 when the site, a former clay pit of the London Brick Company, filled up when the Water Eaton brook broke its banks. It is now used to train divers from the Milton Keynes Sub-Aqua club, who have planted two cars, a bus and a light aircraft in its depths to be explored. Because of the obligation to accept waste from London, the adjacent landfill site has increased in size up to the fence on the west side of the lagoon. The reserve is also prone to fly-tipping and vandalism. West Bletchley civil parish covers that part of Milton Keynes that is south of Standing Way (A421), west of the West Coast Main Line and north of the Varsity Line. Most districts of West Bletchley Parish are residential, but the district of Bletchley Park is important enough to be summarised here. Within the West Bletchley parish, in the Church Green district, is Bletchley Park, which, during the Second World War, was home to the Government Code and Cypher School. The German Enigma code was cracked here by, amongst others, Alan Turing. Another cipher machine was solved with the aid of early computing devices, known as Colossus. The park is now a museum, although many areas of the park grounds have been sold off for housing development. The town is served by Bletchley railway station, on Sherwood Drive and Bletchley Bus Station, on South Terrace off Saxon Street. Bletchley has a rugby union club, Bletchley RUFC, both of which play at Manor Fields just south of Fenny Stratford. Stadium MK, home of Milton Keynes Dons is at the northern edge of the town. Bletchley is separated into three electoral wards of Milton Keynes Borough Council, consisting of Bletchley East (3 Labour), Bletchley West (2 Labour, 1 Conservative) and Bletchley Park (1 Labour, 2 Conservative), and is in the parliamentary constituency of Milton Keynes South, represented by Conservative MP Iain Stewart. 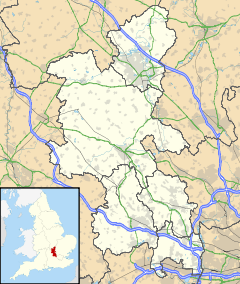 For the 2011 census, the Office for National Statistics designated a "built up area" being that part of Milton Keynes that is west of the A5 and south of the A421, some 1,073.5 hectares (2,652.7 acres). At the 2011 census, the population of the area was 37,114. For the 2001 census, it designated a (larger) "urban sub-area" that approximates to the boundaries of the former Bletchley Urban District Council at the time of the designation of Milton Keynes. It also included that part of Winslow Rural District that fell within the designation. In outline, the ONS Sub-area consisted of Bletchley and Fenny Stratford Civil Parish, West Bletchley Civil Parish and part of Shenley Brook End Civil Parish (specifically Furzton, Emerson Valley, Tattenhoe and Snelshall). At the 2001 Census, the population of the Sub-area was 47,176. ^ a b c UK Census (2011). "Local Area Report – Bletchley (1119884613)". Nomis. Office for National Statistics. Retrieved 10 January 2019. ^ Bennitt, F.W (1933). Bletchley. H. Jackson. ^ a b 'Parishes : Bletchley with Fenny Stratford and Water Eaton', Victoria History of the Counties of England: A History of the County of Buckingham: Volume 4 (1927), pp. 274–283. URL: Date accessed: 17 August 2009. ^ Conn, David. "Peter Winkelman: 'I'm not proud of how football came to Milton Keynes'". theguardian:talkingsport. Guardian Newspapers. Retrieved 10 May 2014. ^ "CMIS > Councillors". milton-keynes.cmis.uk.com. Retrieved 9 May 2018.